Many, many, many years ago I worked a lot with LDAP and the ISO communication standards like X.500 and X.700. Looking at the Metatype specification I am afraid I had some bad influence on that spec. Looking back, I probably would be able to make it a bit simpler today, however, I do believe that it is one of the specifications in the that under-appreciated. Actually, a lot of people have no clue what it is. So what problem does the Metatype spec solve? The problem it addresses is runtime configuration. The OSGi Configuration Management specification makes it possible to configure bundles with properties. The problem we faced that gave us Metatype is that we needed a schema to describe those properties to editors and validators. At the time I was involved in creating automatically created user interfaces based on type information. The Metatype specification provided such type information for the configuration properties. In the first incarnation of Metatype we did not describe a format (seems silly and I forgot why), only hard to use Java interfaces. Later versions added a Metatype Service and an XML based format for describing the properties. The title is derived from the configuration interface name and the property key labels come from the method names, it uses the camel case and characters like $ and _ to turn them into something more pleasant to read for the labels. The _ in front of secretKey and accessKey indicate private properties, they will not be registered as a service property. Notice that he Region, which is an Amazon enum, is used to create a popup list with readable labels and the exact names of the enum. 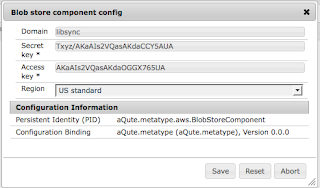 bnd will automatically create this for you. So what do you have to do to make this all work? This is all you have code ... No property handling, not need to check for null properties (by default the fields are required), not mucking around deep in XML, all type safe ... The same package that contains the optional annotations contains a tiny little class that creates a proxy that maps the methods to the property and performs type conversion if needed. If you want to experience OSGi heaven (or at least the road towards OSGi heaven), download the alpha version of bndtools and play with it. This code and other samples are provided so you can directly use them with bndtools. You can find this code at an aQute github repository.The Metatype and Components chapter of the bnd manual define the details. For me, the metatype support is fixing a crucial extra step to take advantage of OSGi. I am looking forward to make many examples in the future that take advantage of the inredible power of metatype + configuration + components. For ant lovers, the latest version is available from the download page. For maven, this will require some collaboration with the maven bundle guys but I will work on this. Enjoy, and hope to see you next week at OSGi Devcon/EclipseCon! PS. The hackathon (or hackaton as I erroneously called it) is on Thursday morning but I do not have the room yet. If you're coming send me a mail and I'll keep you posted. This is great news :-). 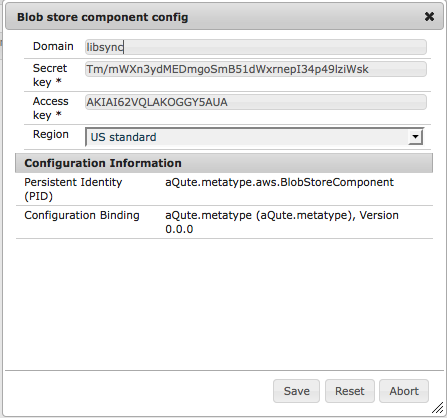 In our product we are also generating (web - GWT) GUI for configuration forms from metatype. Currently all is written in metatype.xml-s.
Our forms support little more than metatype can describe - for example dynamic enumerations where options are result of calling one of enumerable services. Other attribute could be whether String is multi-line or single-line. Or input box with suggestions (editable enumeration). Also validation constraints... XML can be of course extended but I found no means in metatype API to access it. Or did I miss something? I think another step could be to read Bean Validation annotations. They contain a lot of information about attributes that could be used for GUIs (See http://jcp.org/aboutJava/communityprocess/final/jsr303/index.html). I don´t know how much it resemlbes Metatypes but I think there are a lot of similarities. This will only include the code when you actually use it. @Christian: Good idea to use the Bean validation. However, looking at it, it looks like they went a bit overboard and some of the semantics will be hard to capture with the metatypes.